Ancient writings from 5000 b.C. tell us that when someone died the heart was carefully preserved, as it was considered to be the organ responsible for the mind, thoughts and emotions, while the brain was something of little interest and disposable. History shows that it was only after Hippocrates, who is regarded as the “father of Medicine”, that the brain was assigned the responsibility of transporting the mind. Since then, the brain became the object of deep reflections and studies that kept moving forward and kept up with the pace of societies and their physicians and researchers. Until this day, the only Portuguese physician to win a Nobel Prize (1949), Egas Moniz, is pointed out as a reference by his successors when they explain why they have taken interest in the brain. 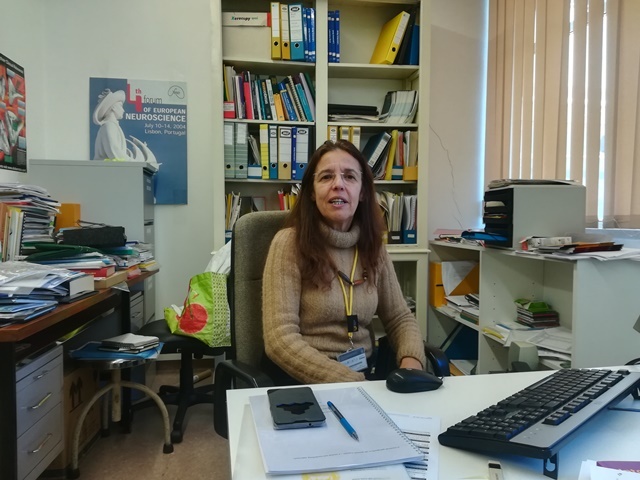 In a month dedicated to Neurosciences, we went to talk to Professor Ana Sebastião, because it would be unthinkable not to listen to one of the strongest representatives of this field of research, especially because she is a part of the Faculty of Medicine of the University of Lisbon. We are met in an office, the door of which is always open, with a big smile and by someone who does not accept any special prominence. She says she is just a cog, among many others, in the wheel of brain science and reminds us that in her researcher’s DNA, there is a collective DNA that results from the Faculty’s historical past. “Egas Moniz is our bond and he was a researcher at this Faculty. His discovery was often misused, misinterpreted, at a time when mental illness and Psychiatry were far from getting any answers. What Professor Egas Moniz, who simultaneously supervised the Neurology and Psychiatry areas, realised was that there was something wrong with the brain and that mental illnesses were a result of a connection malfunction. That is what led him to the hypothesis of Leucotomy, that is, the surgical cutting of white communication fibres of certain brain pathways. This intervention was carried out in a few patients, but they gained a certain quality of life. At the time there were no psychoactive drugs. Egas Moniz used to say something that I always tell my students: “mental disorders originate from the derangement of synapses [points of communication between nerve cells], which are the organic basis of thought”. In the Faculty of Medicine there are many research and intervention areas in the field of Neuroscience, from the clinical component, such as Neurology and Psychiatry, to the pre-clinical component, where my group is located. I am only a part of the whole”. Now we know where your inspiration on brain matters comes from, but to understand how you got to this point, tell us a bit about your professional path. As a Biology student, I started taking interest in animal behaviour, Ethology. I was always very fond of that field of study. However, when the opportunity came to make my Master’s thesis (the equivalent to a Master’s degree, at the time) with Professor Castro Caldas, I developed a study on behaviour, but it was on human behaviour, in the neuropsychological assessment of memory. That is when I learned a lot about the nervous system, about the brain, about behaviour, about areas of the brain associated with certain behaviours. It was very enriching, indeed! But I realised that my will to understand the basics of the questions had to guide me towards studying the cells, the more reductionist nervous system, which best suited my former education in Biology. After that, my Doctoral studies were developed far from the field of behaviour, it was in the field of synaptic function, in neuromuscular junction. It was developed together with Professor Alexandre Ribeiro and the objective was to analyse the control of the synaptic function, the communication between neurons. In this particular case, it was between a very specific neuron, the motor neuron, and the muscle fibre, as a communication model between two excitable cells. My thesis was developed at the Gulbenkian Science Institute. Following my Doctoral studies, I went back to the nervous system, an issue that was really stimulating to me in order to understand the neurological basis of behaviour. I have dedicated much time, and we still put a lot of time in our Unit, to a region that is very much involved with memory, the hippocampus. The objective is to understand how the different neurons communicate in the hippocampus and how that communication is controlled. It is extremely important to think about how neurons communicate, not only how they stimulate each other, but also how they can inhibit each other. Studying communication inhibition is as important, or even more important than communication itself, because that is the basis for the system control. Therefore, we pay close attention to the system’s inhibitory control. Our field of study is mainly focused on the control of neuronal, excitatory and inhibitory communication, by using the hippocampus as the main brain area. Gradually, maybe because we are developing our study at a Faculty of Medicine and the sources of funding are not continuous, we have been more focused on understanding the implications for medical conditions. That is, what is wrong in various medical conditions and what is wrong in terms of neuronal communication. In fact, neuronal miscommunication is the reason behind many pathologies, their origin or early symptoms. Epilepsy is the most obvious example, since there is an imbalance between stimulation and inhibition. The cause, either excitation dysfunction or inhibition dysfunction, varies according to different factors. There is a wide research area, in which we are involved, that consists of understanding the causes for that dysfunction. Epilepsy is one the medical conditions that interests us the most, along with Alzheimer’s disease, multiple sclerosis and amyotrophic lateral sclerosis. We share animal models and projects with other departments, in order to further our research on what is wrong with the neurons. In your description of these medical conditions, where does the adenosine molecule, which is so special to you, come in? Adenosine has been the object of my studies since my PhD thesis. Adenosine is a controller of neuronal communication. There are many levels of neuronal communication. At the basic level, a neuron communicates with another neuron by releasing a neurotransmitter, which is the molecule of communication between the neurons. At another level, there are various molecules, which are the controllers, including adenosine, that control the quantity of neurotransmitters being released, the ability of the neurotransmitter to control other neurons. It is, therefore, a controller of neuronal activity. For us, who are interested in understanding how the neuronal activity is controlled, it is obvious that we focus on adenosine. In addition, it is a molecule with neuroprotective actions. As neurodegeneration is at the root of many diseases that affect the nervous system, adenosine plays an important role in this process. In addition to that, it has exactly opposite effects, that is, in certain medical conditions it can promote or aggravate the injury. It is important to know how something that protects, reverses its action, at some point, and starts causing harm. Have you been able to find any part of that molecule’s path? We, as well as others, were able to understand that many neuronal control molecules activate two different types of receptors (which are other molecules) and what often happens in a pathological situation is that the receptor that mediates the beneficial signals becomes insufficient and the receptor that controls the negative signals starts to emerge. The grounds for that change are yet unknown. The nervous system is based on balance. It is very important for students to understand this balance. A certain drug, a medication for a certain group of patients, which aims at correcting that imbalance and which is known and established, can produce imbalances in an individual who does not need to take it. For instance, the study of cannabinoids is relevant for us in that sense. Such as adenosine, cannabinoids are also used to control neuronal activity. We have endogenous cannabinoids in our brain. Obviously, there are some medical conditions in which it may be useful to correct some dysfunctions of that controller itself. However, we are very interested in understanding how, in animal models, the chronic consumption of cannabinoids may deregulate or unbalance the neuronal activity control. Additionally, we also wish to understand how two controllers of such activity control each other, adenosine and cannabinoids. How they control each other, as they coexist in the same synapses. This is an area that really interests us. Not long ago, we have published an article that shows that cannabinoid-induced memory impairment can be prevented through the simultaneous administration of an antagonist of a certain type of adenosine receptor. We are currently looking for the mechanisms underlying that observation. We are analysing the neuronal communication to try to understand why that happens. Neurotrophic factors are also an area that is attracting our attention. These are neuron protection factors that also have receptors that protect and others that may aggravate the medical condition. For instance, in the case of Alzheimer’s disease there are enzymes that cut the protective receptors and transform them into receptors that aggravate the disease. It is very important to us to study why it happens. You are responsible for coordinating a team of almost 40 people at Instituto de Farmacologia e Neurociências (Pharmacology and Neuroscience Institute). Tell us a bit about how it is organised and who is part of it. We are a big team. The reason for having such a big team is because we favour the critical mass of all the people involved, different persons, who may engage in conversations and share information. Each of these different persons is responsible for a group of students. There is the group of Professor Maria José Diógenes which is focused on Alzheimer’s disease and Rett syndrome, which is a developmental epilepsy, that also results in an inhibition imbalance and originates from a dysfunction that resembles the one identified in Alzheimer’s. The group of researcher Sara Xapelli is more interested in the control of the formation of new neural cells. At this time we know that, throughout life, there is the formation of new neurons and new cells supporting the neurons. That formation is often affected in the case of pathological situations. For instance, in the case of multiple sclerosis, a pathology of interest for the group, the formation of nervous system cells that promote the increase of the speed of communication between neurons is compromised, but it is accelerated at the early stage of the disease. The objective consists of understanding if we are able to take advantage of the moment of acceleration and possibly prevent the progression of the disease. The group of researcher Cláudia Valente is focused on Epilepsy models and on the relation between this pathology and neuroinflammation. We know that neuroinflammation occurs in cases of Epilepsy, so what we are trying to understand is if it possible to stop, or even reverse, the deregulation development, in case we are able to stop the proinflammatory cascades. We are manipulating a molecule that is located right at the beginning of the inflammatory cascade. The group of researcher Sandra Vaz is focused on astrocytes, which are cells in the nervous system that also contribute to the control of the neuronal activity. The objective consists on understanding how these cells contribute to synaptic plasticity. Synapses do not remain unchanged. At certain times, they can be changed by becoming stronger or weaker. This process is very important in the context of memory and is controlled by several molecules, some of them released by astrocytes. The group of Professor Alexandre Ribeiro is, at the moment, focused on the physiopathology of amyotrophic lateral sclerosis. This disease implies a motor neuron disorder. This disorder occurs at various levels, central and peripheral. Our goal is to understand the early signs of this disorder and the level at which they occur first. The group under my leadership studies the control of the synaptic activity which is more independent from the pathology. Studying how the excitatory and inhibitory activity can be controlled. We also try to understand how cannabinoids influence synapses, how the chronic consumption of cannabinoids causes a disorder of that synaptic control and how cannabinoids interact with adenosine in order to control the synaptic activity, regardless of the pathology in question. As if all this was not enough, you are also responsible for the coordination of the SynaNet Project. A Twinning project that began in 2015 and that ends at the end of the year. What were the highlights of these 3 years? As coordinator of the SynaNet Project I can see a number of benefits. It is a project that involves four Universities. The University of Lisbon, the University of Eastern Finland, the University of Rome and the University of Lancaster. All the groups are interested in understanding how synaptic disorders affect neurological and psychiatric pathologies. Some Doctoral students, who are part of our group, are co-supervised by these universities. Being part of an environment that involves researchers interested, on the one hand, in neurological diseases and, on the other hand, in psychiatric diseases allows us to exchange interests. With respect to the SynaNet Project, the common interest are the synaptic disorders and one of the objectives consists of promoting the exchange of students who study those disorders among several groups. The exchange of students between these four schools has been financed during these three years, that correspond to the duration of the project. These students turn out to be a communication channel between senior researchers. There are Doctoral projects that are co-supervised by the various members of the SynaNet. The students are able to learn new techniques, participate in workshops, and attend Summer Schools organised by the different schools. This project allows students to improve their knowledge and strengthen their interests. The financing for student mobility is due to end in December 2018. However, in the meantime, we have established numerous collaborations that will not end on that date. Apart from that, you are the Director of Colégio Doutoral Mente-Cérebro (Mind-Brain College) whose goal is to enhance the organisational, scientific, training and technical ability of the UL with regard to the study of the mind and brain. How was this College developed in the University? That is also one of the duties of the College, which is in fact one of the duties and interests of Rita Aroeira. We have been involved in the organisation of the international brain awareness week for many years now, which takes place in the third week of March all around the world and that week’s goal is to make researchers communicate with the society. There is an international organisation which is responsible for promoting this process and, in Portugal, the first member of the organisation was Professor Alexandre Ribeiro. This event was firstly organised in Portugal in 1998; it included many activities, we visited schools, but there were only two or three of us and we were relatively new to the Faculty. And then it was taken to another level, when the Portuguese Society for Neuroscience got involved in that activity and that was when I, in 2004, as Chairwoman of the Society for Neuroscience, started to get society more involved in this activity. At that time, I relied on the strong support of Professor João Malva from the University of Coimbra, who is really into these matters, and obviously Professor Alexandre Ribeiro, who was always very supportive. We invited Ciência Viva to join this project and, at the time, they were really excited about our idea and things worked out really well. We have developed platforms, where the schools can register, through Ciência Viva, so that we can go to those schools. It was such a great success that we had to limit the number of registrations, because we would not be able to go to every school. It soon became a national event, because the University of Porto would go to schools in Porto, the University of Coimbra would go to schools in Coimbra and we would go to schools in Lisbon. What was the role of the College in this matter? As the promoter in Lisbon, because at the University of Lisbon we began to rely on a greater involvement from other people who were not part of our group or even of our Faculty. Through the College, the participation in the international brain awareness week was extended to the whole University of Lisbon. Another step forward taken by the College is the organisation of round tables for the general public. There is a really funny story from the first round table organised by Rita. It was raining cats and dogs and the subject to be discussed was Parkinson’s disease and those were the type of patients who were expected to come and meet us, so you can imagine how hard it was to move around and travel. That morning I told Rita that no one would come because of the rain and yet the room was full. In fact, people, patients and caregivers, came and it was a huge success. There were other round tables on Alzheimer’s and Sleep. The fact that we all know each other turns out be a way of convincing other colleagues to take part in these round tables, on a pro bono basis, just for the pleasure of interacting with society and of opening up to the outside world. I believe we need to invest more in the interaction with municipalities and with a more organised component of society. The City Council of Lisbon (CML) is already cooperating with the University of Lisbon, as well as with the Mind-Brain College, because if we are discussing active ageing, it makes sense to integrate the urban division, for example. A few days ago, I was in Kuopio, Finland, and I saw a tourism poster in which it was written that investing in the development of parks results in a reduction of the costs associated with psychiatric diseases and that having a healthy life and spending more time in parks is a way of fighting depression, which is a very critical disease in northern countries. They realise that they save a lot of money by “spending money” on parks. Regarding the CML, it has shown interest in interacting with the University, in order to connect the urban issues with the matters of the mind and brain. However, we need to pay more attention to this subject. Neurodegenerative diseases, active life and mobility are, for sure, very critical issues and, therefore, there is an interface between the “structures of society” and those of the University, that we would like to expand. We have already achieved some things, but it is an important door for the future, because it is important to expand. That is exactly one of the College’s duties, to say “we are here and we can be useful, but we need you” (City Councils, Parish Councils). To be mutually useful at many levels. These Science dissemination activities are also interesting to show society what we do and be aware of what is expected from us; on the other hand, it is a good opportunity for students to practice their ability to talk about Science in a language that can be understood by everyone. Because what is difficult about Science is to make it simple. I have learned that from Professor Alexandre Ribeiro. Even if a piece of information is very complex, we should make it simple, so that everybody can understand it. And, in fact, these events brings us closer to society, so that we can explain Science in a simple way. Simple, but not simplistic. The College has the ability to bring students and also researchers together, so that we can all contribute to make Science known outside these institutions. It also represents a great opportunity for the University to increase its exposure, for both students and professors. You gave us this idea of social mission, but we know that you also have a mission as a leader, because you are also known for being extremely zealous and proud of your teams’ work. Without limiting their visions, so that each one of them finds their own path. That is the role of any person with a university career. We have to train others, who will later train others as well, and thus will gradually acquire their own autonomy and ability to train. This is how things work, as a pyramid. I think that it is very sad for someone to end their career and not to leave any successors. And those successors may not even stay at our place of work, they may and should go to other places, but it is important to create a continuity. I have inherited this spirit from my academic supervisor, Professor Alexandre Ribeiro, who was always very good at that. He knew how to spread his collaborators across all universities in the country, he has Full Professors virtually across the country. We should also leave someone that will continue our work. It does not depend on us, if someone else joins them, our mission is to train people. And teach them to be autonomous, which is the basis of our job and is not exactly a question of merit. I believe that it is exactly the other way around, it is a matter of demerit when people don’t do that. This continuity generates benefits, as it is extended to the students engaged in the dialogue and broadens the basis of influence. And it may even facilitate financing. Working in the field of Science is a way of leaving a legacy. This legacy may concern publications only, but it is very important that it includes training other people… That was the greatest difference that I felt, despite the responsibility and work load increase, the difference between being a single researcher and guide every other Doctoral student, and moving to the University where the responsibility is much higher. However, there is a greater chance to be noticed by the students, to take the social mission further, and this becomes a snowball. The growth is far bigger, because you create several circles. Regarding my team, the reason why we stay close together has to do with creativity and sharing the same means and work tools. The same animal is used by several people; each one of us uses the area needed for our work, thus saving resources. We also share drugs, antibodies and, in the end, that is what strengthens the team and prevents people from working alone, regardless of the interaction they have with others. It is true that you still like to put on your lab coat and work at the bench? Acknowledgement – The editorial team would like to thank Dr. Rita Aroeira for her invaluable collaboration in collecting the information and preparing the interview and for all the support provided during the entire process.